Stop an onslaught of renegade bowling pins with balls of matching colors. Use bonuses, power-ups, and an arsenal of super-powered balls to knock back, freeze, and obliterate the pins. In addition to the 90 level campaign, the game features 6 Mini-Games and an endless Survival mode. 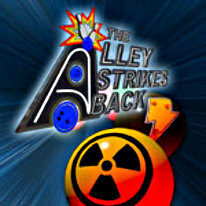 With this much action packed into one game, "The Alley Strikes Back" will certainly provide many hours of entertainment for players of all ages.